The backwaters around Hilton Head, South Carolina offer some of the best inshore saltwater fishing that you will find anywhere. The things that I really enjoy about inshore fishing is that the trips are relatively short , we don’t have to make far runs from the dock to get to the fishing grounds, the waters are calm and it is very interactive. I use light spinning tackle and fly fishing gear for all of my inshore fishing charters so you can guarantee that fighting these fish will be a blast! Through out the year we fish the inshore waters for species such as redfish, speckled sea trout, flounder, sharks, triple tail, cobia, tarpon and bull redfish to name a few. Moreover, while fishing inshore we always see a diversity of wildlife from various birds to bottle nosed dolphins. Let’s take a look at some of the different inshore fishing trips that we have available. Flats fishing is one of my favorite ways to chase fish inshore. Flats are basically areas of shallow bottom that have little contour and drop off gradually. These areas allow the fish to move freely within the shallow water with little treat from predators such as bottle nosed dolphins. To fish the flats we use a specialized boat (called a flats boat) to move quietly through the shallows as we look for the fish or we may even hop out of the boat and wade fish during the summer. 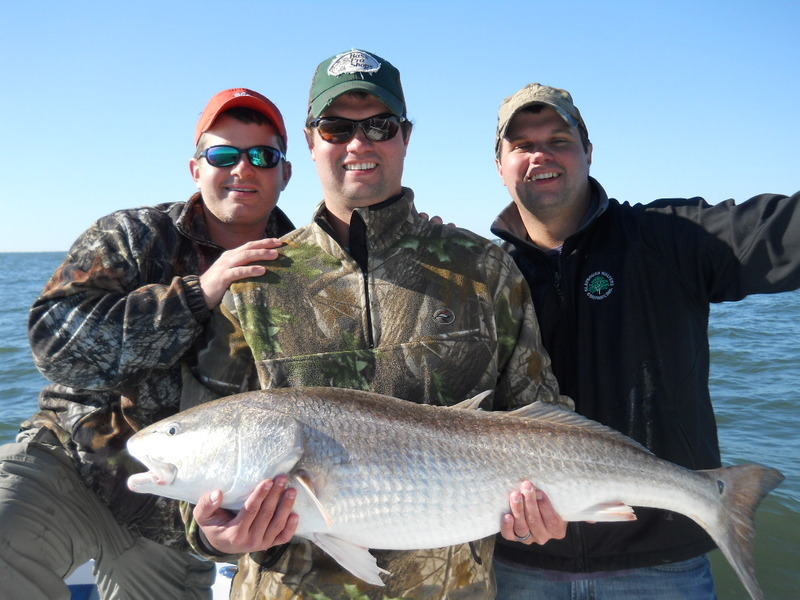 The primary species that we fish for on the flats are redfish. During the winter months we are poling the inshore flats looking for schools of fish as they cruise through the clear shallows. The summer months offer us some truly exciting action as the redfish start to feed on fiddler crabs dipping down and exposing their tails as they feed! In all cases, flats fishing equals sight fishing and there is nothing like seeing the fish, making the cast, seeing the bite and getting a hard hookup! When I say “saltwater estuary fishing” I am primarily talking about fishing the inshore backwaters around creeks, grass edges and oyster bars. We have a huge tide swing here in Hilton Head that ranges anywhere from 7-11 feet. With this much water flowing between the high an low tide the fish will be in different areas depending on the stage of the tide. Basically on low tide we will find the fish pushed out onto the flats and as the tide rises they hover around the oyster bars and then into the creeks and then as we approach high tide the fish will move into the spartana grass. 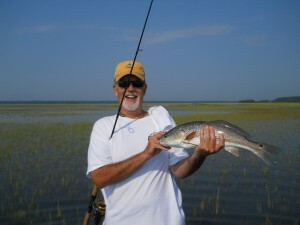 Around the higher stages of the tide we spend most of our time fishing with live baits and artificial lures for species such as redfish, flounder and speckled sea trout. This makes for a great day of fishing as you tend to catch a nice variety of different fish and there is steady action. This style of fishing is loads of fun for everyone from the beginner to those of you who have fished all over! 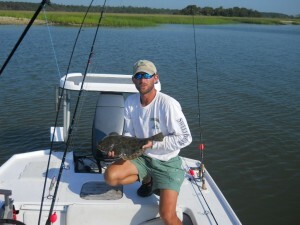 In the main saltwater rivers such as the Broad and the Port Royal Sound we have all sorts of sport fishing options. This is where we catch some of our larger inshore fish such as cobia, tarpon, bull redfish and sharks. These areas also hold a lot of smaller fish such as black sea bass, whiting, blue fish and spanish mackerel. The spring, summer and fall months tend to be the best time of the year to fish in the rivers. There are many different techniques to fishing these deeper waters that range from anchoring up and bottom fishing to trolling to sight fishing for fish cruising on the surface. 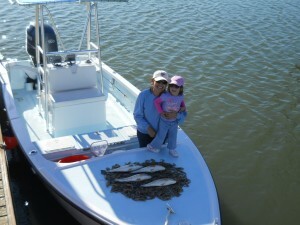 It doesn’t matter how we do it, fishing the inshore waters makes for a fun and relaxing day.